YOUR MAMAS NOTES: Since Your Mama was, so to speak, down in Nashville yesterday dissin' and discussin' the real estate doings of country music's reigning king and queen Tim McGraw and Faith Hill we figured we'd stay camped out in the Music City environs where—we learned from The Bizzy Boys at Celebrity Address Aerial—a dignified Neoclassical villa in an affluent, semi-rural suburb about 10 miles south of downtown Nashville (TN) was quietly scooped up in May (2013) by another couple of country music royals: Ronnie Dunn and his wife of 20+ years, Janine. For nearly 25 years Mister Dunn was the Dunn half country music's esteemed and accoladed Brooks & Dunn duo who have earned a trophy shop's worth of industry awards including 17 CMAs, 26 ACMs, 3 AMAs, and 2 Grammys. For better and worse, the duo may still be best known for their twangy, 1992 single Boot Scootin' Boogie that, along with catchy ditties like Miley's daddy Billy Ray Cyrus's Achy Breaky Heart, reignited the line dancing craze that swept honky tonks from coast to coast in the 1990s. Misters Dunn and (Kix) Brooks parted professional ways a couple of years ago and Mister Dunn now pursues a solo career. His first solo single, Bleed Red, went to #10 on the Top 10 in 2011. 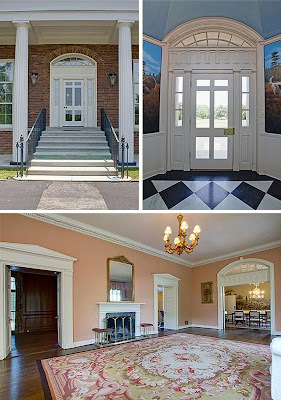 Readily accessible online resources reveal the stately estate was first listed in October 2011 with an aggressive asking price of $4,400,000. By early 2013 the official price tag had plummeted to $2.8 million before Mister and Missus Dunn came along and drove the final sale price down to $2,000,000. 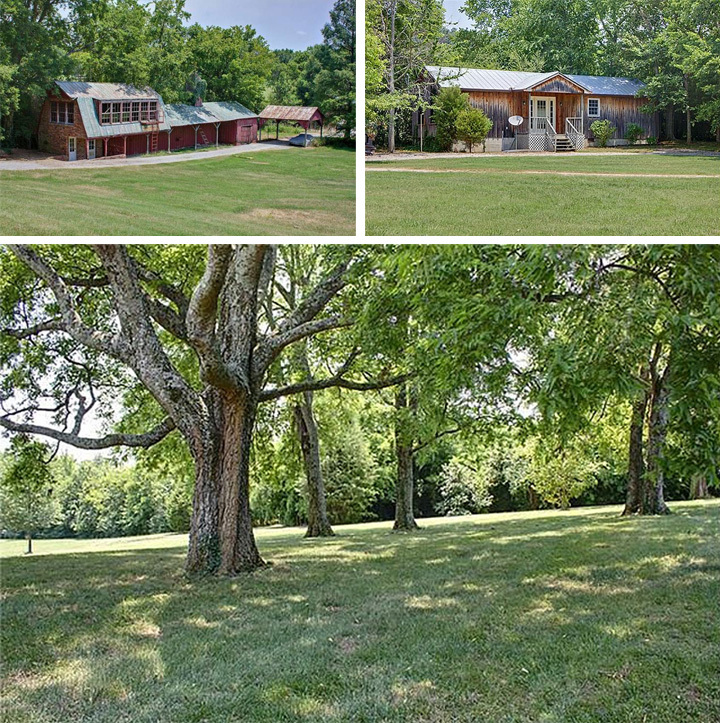 Fun Fact: The 6.41 acre spread is surrounded on three sides, according to property records Your Mama peeped, by the sprawling, 130+ acre, multi-residence compound-estate of Philip Bredesen, a former healthcare/insurance industry tycoon who served as the mayor of Nashville throughout most of the 1990s and, from 2003-2011, as the governor of Tennessee. The noble Neoclassical villa, an elegant red brick central pavilion symmetrically flanked by smaller, identical wings—sits 500 feet off the road down a picturesque tree-lined driveway and was designed, as per listing details, by noted Palm Beach (FL) architect John L. Volk. 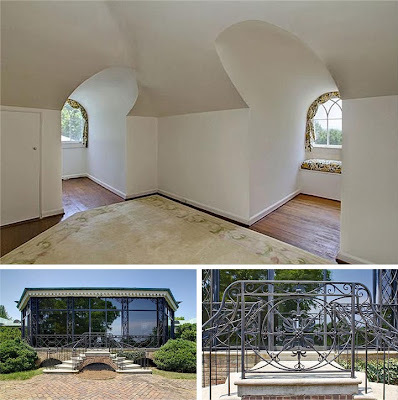 Listing information Your Mama perused goes on to indicate the house was built in 1948 for a well to do fella named Philip Kerrigan, a local master metalworker who owned an eponymous iron works that provided the ornamental iron detailing seen throughout the villa and gardens. 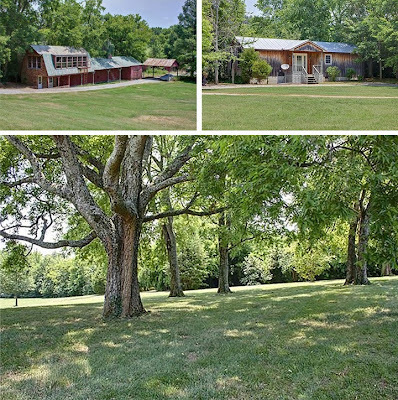 The Kerrigan family sold the property to its current owners in June 1995 for $1.5 million, making Mister and Missus Dunn only the third owners of the property. The 1.5 story, 11-room residence measures in at 5,751 square feet, as per listing details, with five bedrooms, 4.5 bathrooms, 2 fireplaces, and well-proportioned public rooms meticulously embellished with elaborate moldings, pilasters, and pediments that Your Mama imagines were probably crafted on site by the hands of skilled tradesman and not, say, purchased at one of the big box mass retailers of home improvement goods. 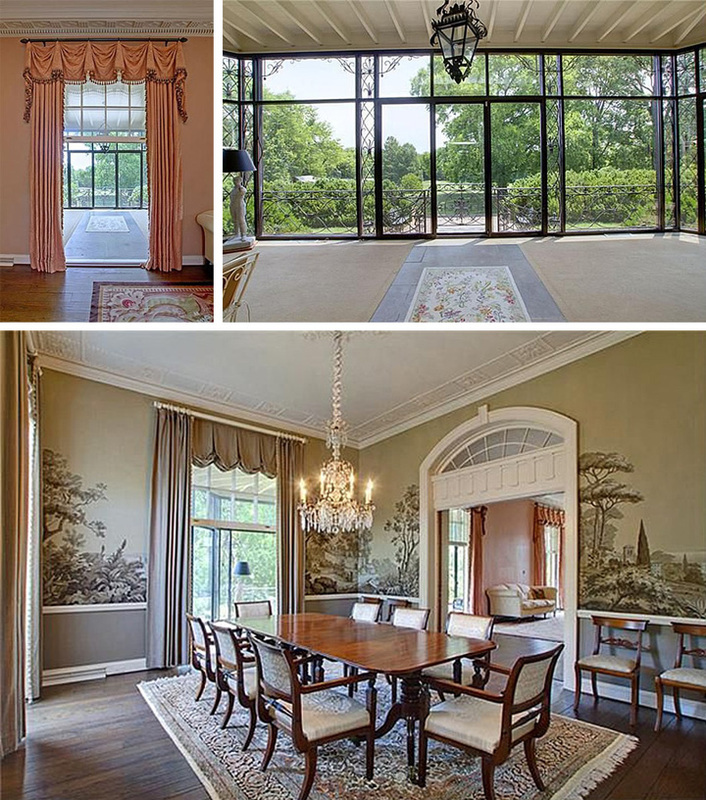 Other rigorously executed architectural details include elliptical transoms, concealed pocket doors, jib windows, groin vaulted ceilings, florid iron work—natch, and walls sheathed with scenic, handcrafted woodblock printed wall coverings from the profoundly pricey French wallpaper manufacturer Zuber & Cie.
Black and white checkered marble floors laid on the diagonal lend a formal elegance to the center hall entry. To the right there's a butch, wood-paneled study and straight ahead is a 33-foot long Grand Salon with rich wood floors, 12-foot ceilings, and a wood-burning fireplace. Pocket doors slip into the walls between the grand salon and the formal dining room and spectacular jib windows lift open to link the grand salon to a stone floored glass and iron conservatory that overlooks the gardens and broad lawn at the rear of the residence. The garden areas are linked by herringbone pattern red brick pathways and include unusually large boxwoods and slightly unkempt parterre. Oodles of mature shade trees dot expansive sweeps of lawn, and next to the side motor court there's an absolutely lovely, if down on her heels, iron and glass greenhouse with louvered ceiling. Your Mama's brief and unscientific research shows the venerated country music veteran and his long-time missus own a number of other residential properties including at least one condo in the hip and stylish Nashville nabe known as 12 South. 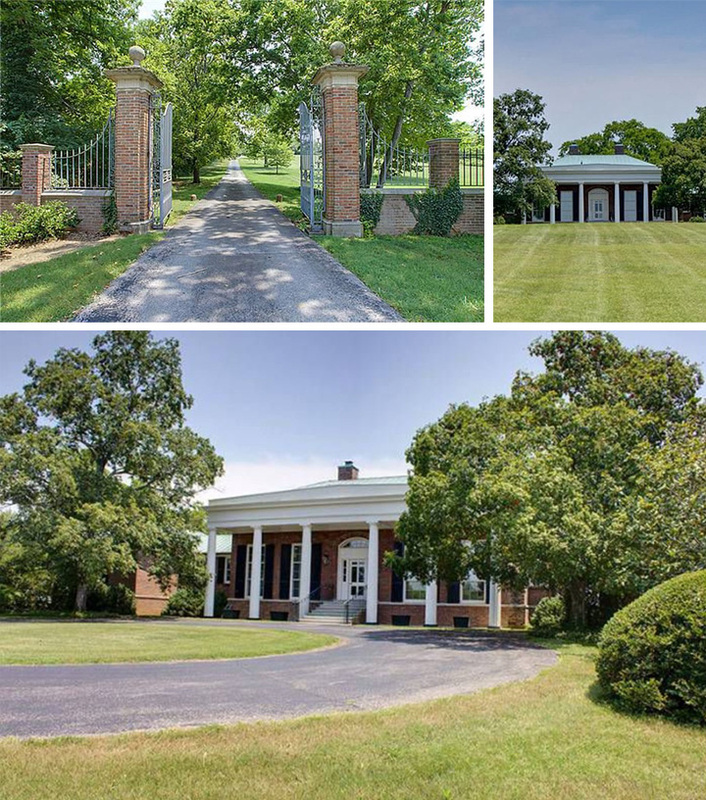 Since 1996, when they bought it for $900,000, the Dunn's primary homestead in Nashville has been a 10,000+ square foot mansion with extensive equestrian facilities on 16 (mostly landscaped) acres about 10 miles south of downtown and in 2007, according to property records, Mister and Missus Dunn spent an unknown amount of money for a large, southwestern-contemporary residence in Santa Fe, NM. Mama can we get off the Country theme for a while?? As a country music fan, I enjoyed this post. But Mama, "mogul" doesn't seem the right word to describe Dunn, or any creative artist. You wouldn't call Harrison Ford or George Clooney a Hollywood mogul, though you might describe a studio director or producer that way. I think the same applies in the music industry, don't you? Anyway, thanks for the interesting post. This is a special and extraordinary house. Thank you for writing about it, and please don't listen to the first poster. Tim and Faith's farm is also quite beautiful. Would love to see pictures of the house they actually live in, which looks very intriguing from the aerial you provided. Will have to google and see if it's been shot for anything. Apparently, some of these country music folks have very good taste. . . (though you just know the Judd's don't). I so hope they don't get rid of that Zuber paper in the dining room. The designer David Netto used a Zuber (or maybe Gracie) paper in his New York apartment bedroom, and it was just the coolest thing the way he worked it with very unexpected furniture, etc. The pictures are around if anyone's interested. One of my most favorite apartment interiors ever. Anyway, got completely off topic here. Amazing estate! Kind of makes real estate prices here in Southern California look foolish, don't it? 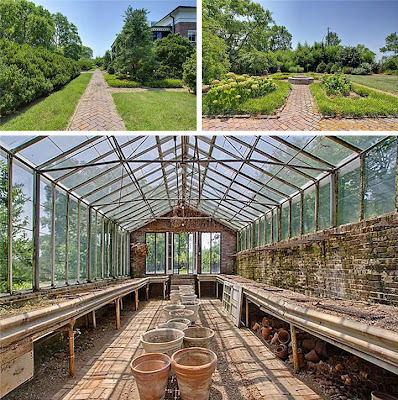 Would donate the caretakers cottage and bring the incredible hot house back to life...including air conditioning because, let's face it, the humid weather is a determining factor in the cost of living there according to Nashville friends of mine. Great post to start the weekend. Thanks Mama Dearest. PS: Can't believe I pecked this long message on my iPhone.